In past blog posts, (for example here) I have described part of the story of how, nearly 30 years ago, when I was living in London, I met a man who showed me a series of spiritual exercises which would, he promised, enable me to discern my personal vocation, and then follow the path towards it. I followed his guidance, and it gave me exactly what he promised, along with many more unexpected benefits. Not only did I change my career path completely, so that I became an artist without having any formal qualification in this or any even remotely related field; I was also converted from a bitter and unhappy atheist into a believer whose life was (and still is), generally, happy. Furthermore, this set me on a path that led, about five years later, to my reception into the Catholic Church. I have now written a book (with a forward by Fr Marcelo Navarro, I.V.E.) that tells the story of how this happened and describes in detail how to do these exercises. It is called The Vision for You. What is remarkable about my contact with him, it seems to me, is not only the process he showed me (which I describe in detail), but also the fact that he was able to entice someone as antagonistic, and indeed, hostile, to the idea of God and to Christianity as I was, into being prepared to commit to a process of deep reflection, prayer, and meditation in the Western tradition. I realize now that the way he presented it to me was a perfect model of evangelization, and so, with the thought that this might be of interest to others too, this is why I tell the whole story of my conversion. The man who showed this to me was called David Birtwistle. He was in his mid-60s when I met him, and I was 26. I was introduced to him by a mutual friend, who was already being guided by him. David was a Catholic (and ultimately became my sponsor when I was received into the Church), but he didn’t talk of his Catholicism or of the Christian roots of the process. He just told me what to do in order to have a happy life. This was good judgment in my case; if he had pushed religion onto me at that stage I would not have been interested. This program of spiritual exercises, while clearly coming from the Christian tradition, was as far as I can tell, unique to David both in the way he had put it together, and in the fact that it contained elements which he had developed himself. It is a program of activity that requires some time and work, rather like Ignatian exercises, but they are not the same as anything coming from St Ignatius that I have read. It involves first a structured daily routine of prayer and meditation, which establishes and maintains a connection with God; second, a period of deep reflection on one’s sins and our need for forgiveness; and finally, of listening to God’s call and following it. When the time was right, he did show his hand in regard to his own faith. So, for example, I had known him for three years when I told him that I had decided I was Christian and was shopping around churches of different denominations to see where I fitted in. I was still unaware that he was Catholic. He didn’t even tell me at this point, but he did direct me to “a church in South Kensington” which he thought I might enjoy. “Make sure you go at eleven o’clock,” he had said to me firmly. What I didn’t know was that he was directing me to Solemn Mass at the London Oratory! I was not the only one he helped. Aside from my friend, in the time I knew him he I saw him show this process to dozens of people upon whom it had the same impact. He died of a heart attack nine years after I met him, and over 600 people came to his funeral in West London, some of whom had flown in from thousands of miles away in order to be there. They were people from a whole range of social backgrounds, from investment bankers to construction workers. I decided to write this book for a number of reasons. First is my belief that the combination of these exercises (which I still practice daily even now) and the sacramental life of the Church offer the greatest happiness that I can have in this life. I thought that some, both inside and currently outside the Church, might be interested in the gift I was given. Furthermore, I thought that those who are in the Church and are happy, so that they do need feel any particular need to go through such a process, might nevertheless be interested in David’s method of evangelization so that they can use it themselves. The main weapon, so to speak, that David had was that he was so obviously at peace, and he also knew how to transmit this to others. I describe in some detail, as best as I can remember so many years later, the conversations we had and how he went about convincing me that he had something he could pass it on to me, without my ever feeling I was being manipulated or pushed into something I didn’t want to do. Finally, the route to happiness that this program gave me was through the discernment of my personal vocation. My belief is that many people who are unhappy in life, whether Catholic or not, are unhappy because they are not doing what they are meant to do. This process, I believe, can offer a new direction that may bring the happiness you are looking for. When I met David, I was so unhappy that I was about to look for a therapist or psychiatrist who could offer counsel - or a prescription - that could change the way I felt. David suggested to me that I might like to wait and see how I felt after the process, because he thought it might solve my depression. I am glad that I followed his advice. My experience is that this process was able to take me from where I was to where I ought to be. The degree to which this will re-order you life depends, of course, on how far you are from the path that God intends for you. In my case, this was a profound dislocation that didn’t just change the direction of the path I was on, it helicoptered me onto a whole new path. And again, what is remarkable about this, is that once I discovered the degree where it was taking me, I was more than happy to go along with it. I decided to write it now, so many years after David died, in part because I noticed that the blog posts I referred have had as positive response as any that I have written. Also, I have now had experience of taking several dozen people through this process myself and have seen it work for them too. All of them were given either a new or deeper faith in God, and several have even converted or returned to the Church. This has given me the confidence to believe that I have sufficient experience and understanding of the process to put it writing for, one hopes, the benefit of others. 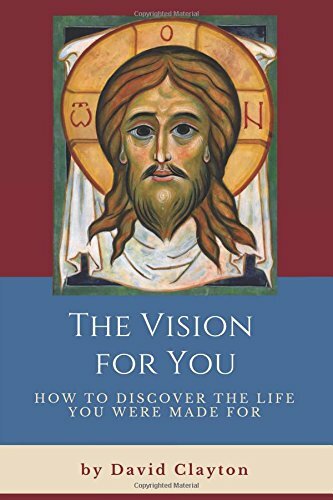 The Vision for You, How to Discover the Life You Were Made For can be ordered online here.